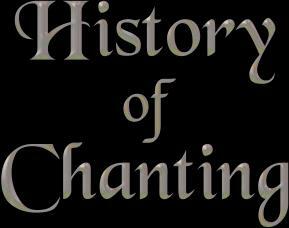 As to history of chanting – the origins of chanting go back farther in time than does history. For history technically is that which has been written down. I believe, and it is indeed very probable, that chanting began not only before the written word, but perhaps before complex vocabularies were in use. Imagine living among your Neanderthal tribe's folk... At the end of a difficult day of gathering the Midsummer's wild herbs and grain, or of hunting the boar for this week's feast, all gather around the fire to take stock of their families' well-being, and to feel the warmth of companionable pleasure. The Timekeeper, the Moon, hangs high in the starry blue of the mid-eve's sky. All know that She is receding into her magical darkness, for upon this night she shines as a silver Crescent, pointing toward the way of the setting Sun. Very soon the young women – to the shuddering awe of the men folk – will bleed, whereupon they will share the nights with each other, perhaps singing, chanting and dancing. But upon this night all are gathered together as one. There is peace, and time to thank the Spirits who have aided in the bringing of this bounty upon them. There are tender caresses, the holding of hands, the preening of each other's hair and simple utterances of affection among them. But a great urge that dwells deeply within them – a spiritual need – leads them to the repetitive utterance of simple one syllable words as chants. All join in, even the older children, to feel the connection and oneness with each other, the Spirits, and all that exists around them. We do know from history written in stone and upon clay tablets that chanting, as well as written poetry – to be uttered by spoken word – descends into the shadows of pre-civilization. Ancient texts reveal ceremonial prayers uttered by priests and priestesses of the "Houses of Life" – temples and universities – of the early Egyptian Mystery Schools as well as utterances of magic and many standardized poems found hidden within the vaults, or buried beneath, the great temples of Sumeria and Akkad. Some of these, according to current theories of dating, go back almost 6000 years. Although, as we all know, these dates continue to be stretched ever farther backward in time. We can only imagine how beautifully spoken were these texts. More than likely they were "en-chanted" or sung in repetition. In fact, beautifully drawn and painted hieroglyphic texts reveal musicians and singers performing at banquets and other cultural functions. Could these be the carried forward traditions of our Neanderthal and early human ancestors? Coming forward in time to perhaps the past two hundred years – during the age of the Anthropologists – many studies have been done of indigenous peoples around the world that have revealed chanting in one form or another as a regular feature of their magical and religious practices. Of course, today, most of the world's great religions include chanting in their devotionals and ceremonies. Even, and perhaps most especially in the United States, the independent charismatic Christian churches delve deeply into the altered states of consciousness found in trance and chanting. One wonderful example of group participant chanting is the call and response Hindu folk tradition of Kirtan. I have attended many of these, and the way that they were presented is this: a band of perhaps four stringed and or other musical instruments, such as a pump organ called a harmonium, as well as two or three percussionists accompany a lead chanter/singer along with two or three harmony vocalists, filled the stage, or area, behind a beautiful devotional altar stretched out across the floor. The lead singer offers lines of devotion to the great Hindu Goddesses and Gods, by calling out their names along with simple praises in the ancient Sanskrit tongue. This is followed by the audience participants chanting or singing their response in like kind. All is done to the beautifully performed strands of Hindu folk music. What a fabulous sound these create! Usually each en-chant-ment begins quietly and slowly with reverence, but by the end of each song the intensity has grown to a peak of fervor, and perhaps, revelation. The calling of the names of these ancient and powerful Gods and Goddesses fills the air with a static tension, but then at the end of each the pace and intensity slow to a peaceful reverence, and then quietly ends. Take a deep breath everyone and relax... By the end of each evenings' Kirtan I have felt physically and spiritually en-lightened. I live in Nashville, Tennessee, and here, there is a beautiful Kirtan group called Samavaya, who perform on a regular basis. If you live within a reasonable proximity of Nashville, do come and check them out! Or, watch for their performances in nearby cities. George Harrison and Ravi Shankar produced a Kirtan album, called “Chants Of India”. I have heard it and thought it was wonderful. You may want to check it out as well. There are many books of chants from around the world that you can buy, including songs of Shamans. These are inspiring to read and then to learn and practice. You can also compose some your own. I highly recommend that everyone keep a written journal of their visions, dreams, wishes and experiences. In your personal journal – or Book of Shadows – you can keep a record of your own chants, poetry and expressions of feelings or devotion. These may be well thought out and rhymed short versus or seemingly non-sensible words that have come to you through meditation or in your dreams. Try this: spread an old blanket, a piece of cloth from an old worn out but beloved dress or jacket and jeans, or your grandmother's quilt, etc. – or a new one you have bought just for this purpose – upon the floor in your favorite room, or in your garden or yard, perhaps beneath a tree or any other place where you feel safe and unbothered by other things or people. This will then becomes your "Sacred Space", Shaman's blanket or prayer rug. You will notice after some time and some practice that this very blanket or piece of cloth becomes a holy thing, like a Temple, a Church, a Grove or an Altar... In other words it becomes indwelled with great energy. And it is yours alone. Next, place a large plate upon the blanket in front of where you will sit. Then, put a white – or any other color that you choose – candle upon it. See any of Scott Cunningham’s Candle Magic books for info. on the meaning of traditional colors. Then simply light the candle and gaze at the flame. All the while you are doing this breathe regularly and deeply - in through your nose and out through your mouth. Do not exaggerate your breathing, just use regular comfortable breaths. As a note; fire and flame gazing probably dates back to those Neanderthal and early human ancestors of ours… The gazing and breathing in combination will relax you and give your conscious mind something to focus on as you subtly shift into the realm of the Great Unconscious, where all thought is primordial knowing and connected to the great All. Now with that part of your conscious mind that is still active – and indeed it is always still active as you are alive – remind yourself that you are here at this time to receive a chant. If you are a writer, have your journal with you and perhaps you may receive the blessing of being the recipient of automatic writing. However, if you are not so inclined, just listen. Don't be shy. The "Voices" will sing to you. They are always there, it is simply a matter of how receptive you are to their subtleties. "Give me the words to chant, oh-la-la, la-lay, la-lee, the words to chant... give me." "Oh why will the words not come to me? Oh why, oh way, oh wee... Oh yes the words they come to me, oh-why, oh-way, oh-wee..."
Or some such thing. Then allow the words to mutate and evolve. It's all good and will set you on the magical road to chanting. Your body and your consciousness will tell you when it is time to end for this day. Listen to them.